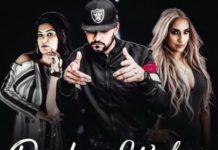 4 by 4 Lyrics – Shipra Goyal Ho Jatti 4 By 4 Leke Ghumdi Hawa Ji Tu Kare Jeep Di Four By Four Is New Punjabi Song Sung By Shipra Goyal. Music Is Composed By Ikwinder Singh And Lyrics Are Given By Alfaaz. Song Is Released Bt T Series Apna Punjab On 20th Dec. 2018. Enjoy The Lyric And Video Song Of 4 By 4 By Shipra Goyal. Chaali Kille Paddi Na Te Jatti Maujaan Maane..
Hawa Ji Te Kare Jeep Di..
Te Teeja Mainu Baleyaa Shikaar Da..
Phirda Ae Phukri Ji Maardaa..